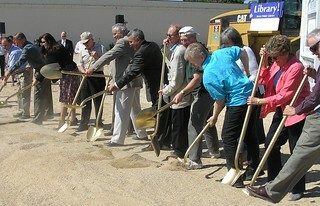 Wielding golden shovels, a dozen city and library officials broke ground June 17 for construction of a 15,000-square-foot Evergreen Plaza branch of Boise (Idaho) Public Library. The system is in a growth mode, with its first two full-service branches opening in February and March this year, Evergreen Plaza scheduled to open in 2009, and a fourth branch in southeast Boise planned to open in 2010. Evergreen Plaza is the library’s first-ever new-building project, however; the earlier branches both opened in shopping centers and the downtown library opened in a refurbished building.